If you're on a mission for a casual yet incredibly chic ensemble, dress in a red coat and black leather leggings. As well as totally comfortable, these two garments look great when worn together. Bump up the cool of your getup by rounding it off with Calvin Klein 205W39nyc Ankle Boots. If you're on the hunt for a casual yet totaly stylish ensemble, try teaming a black leather biker jacket with black skinny jeans. These garments are super comfortable and they will also look great paired together. Dress up this ensemble with Calvin Klein 205W39nyc black leather ankle boots. If you're on the lookout for a casual yet seriously chic look, wear a navy denim jacket and a grey bodycon dress. These items are very comfy and they also look stunning when paired together. Throw in a pair of Calvin Klein 205W39nyc Ankle Boots to instantly up the chic factor of any outfit. If you're scouting for a casual yet totaly stylish ensemble, try teaming a beige blazer with white shorts. These two items are totally comfy and look great paired together. Make black leather ankle boots your footwear choice to take things up a notch. If you're looking for a casual yet absolutely stylish ensemble, try teaming a grey crew-neck sweater with a navy pencil skirt. Both of these garments are very comfy and they also look fabulous when paired together. Choose a pair of Calvin Klein 205W39nyc black leather ankle boots to take things up a notch. If you're searching for a casual yet totaly chic look, wear a red leather biker jacket with black wide leg pants. As well as very comfortable, these two pieces look great paired together. A pair of Calvin Klein 205W39nyc Ankle Boots adds more polish to your overall look. If you're on the lookout for a casual yet totaly stylish look, make a grey coat and burgundy leather leggings your outfit choice. As well as super comfy, both of these items look wonderful when worn together. Let's make a bit more effort now and grab a pair of Calvin Klein 205W39nyc black leather ankle boots. If you're on a mission for a casual yet absolutely chic getup, team a beige silk long sleeve blouse with a black leather mini skirt. These two items are super comfy and look fabulous together. 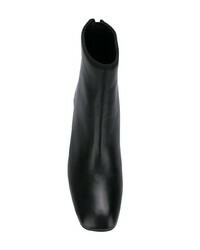 Amp up the cool of your getup by completing it with Calvin Klein 205W39nyc Ankle Boots from farfetch.com. This pairing of a tan wool blazer and light blue denim shorts is an interesting balance between casual and flirty. 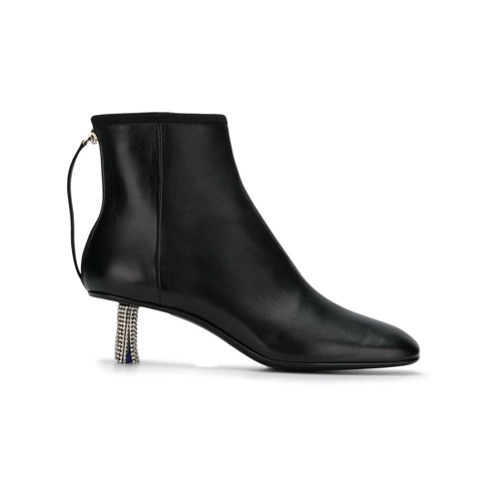 Up the cool of your look by complementing it with Calvin Klein 205W39nyc Ankle Boots from farfetch.com.